Handmade in France using the finest Sheffield Carbon Steel, this stunning Cut Throat Razor combines perfect form with perfect function. Looked after and maintained properly this razor will provide you with decades of daily use. Etch washed with black acid onto the face of the razor are the words 'Le Dandy'. The tang is stamped with the Thiers-Issard Crown logo and the words 'Thiers-Issard Made In France'. These razors leave the workshop in a 'shave ready' condition. However the cutting edge of the razor (the fin) may bend over ever so slightly. Stropping will right the fin. This razor should not need honed for at least 9 months if stropped properly. We recommend you watch some YouTube tutorial videos before your strop this razor. To prevent corrosion, after use, you must dry the razor thoroughly and store in a dry environment. The razor will benefit from a light application of razor oil if it's going to be stored for more than a few days between use. The blade is 'full hollow ground' with a 4.5mm thick spine. Handle Finish: Black celluloid handle. 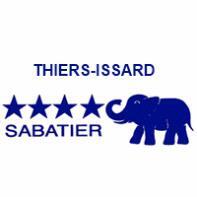 Located in Thiers, France, Thiers-Issard have been making cut throat razors since 1884, they still use tried and trusted traditional manufacturing methods and every razor that leaves the small workshop is tested and passed as 'shave ready' for your use. This is a serious razor, beautifully made, the Le Dandy comes to you shave ready in a Thiers-Issard branded Leather Pouch. A well made, trustworthy razor that comes to you at a fantastic price, this is one of our most popular cut throats - perfect for beginners and experienced shaving enthusiasts alike. Made in France, the traditional way. Please browse our Help and Advice section to have all your queries about cut throat shaving answered, click here to read our 'How To' guide. Sheffield carbon steel, celluloid scales.